Love your pic of the bees in the flowering tree. In Arizona the African Sumac trees bloomed late January and February. The trees were so full of bees. They were so intent on gathering nectar that they weren’t alarmed by my presence. I love to stand under the trees and listen to the humming and watch them at work. Fascinating. It sounds like the trees were singing to the world! I miss seeing things bloom so early in the year! Definite benefit of living in the desert I think. :) Glad you had a similar experience with your blooming trees! 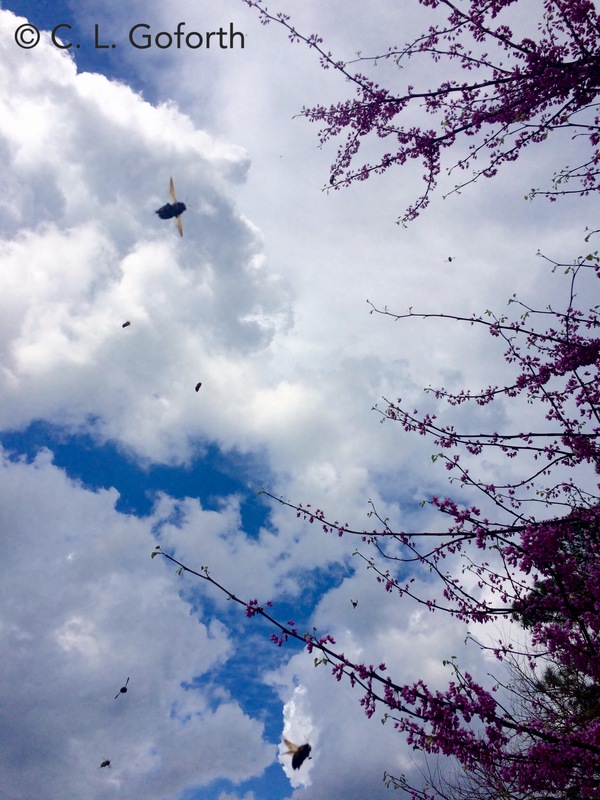 I think it’s just lovely to have them buzzing all around me, such a beautiful sound. I’ve had that experience too! Definitely not magical. I’ve heard that before, but I haven’t ever tried them! Maybe I will this spring. There are certainly a lot of blossoms on the trees right now! Hope you have nice weather on the way soon! The best is when bees get into fermented nectar and get a little drunk, but wobbly flowers are good too. Bees really aren’t that graceful, as insects go.